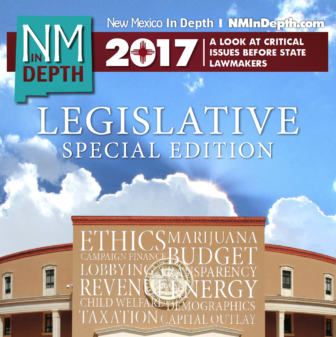 The 2018 New Mexico In Depth Special Edition focused on New Mexico’s state legislative session will include stories that set the stage for our reporting during the session on a range of issues, including government ethics, campaign finance reform, the economy and child welfare. It’ll also include commentary from insightful community members about pressing issues facing our state and provide a profile of the composition of our new state legislature. Click to see >>> NMID’s 2017 Special Edition. Your sponsorship provides crucial support for our statehouse reporting. Will you join the team as we kick off our 2018 coverage? Your sponsorship will be seen by over 100,000 New Mexicans statewide through newspaper publications, and through publication on our website and promotion through social media. The special edition will be published in the Sunday edition before the session begins: The Santa Fe New Mexican, The Farmington Daily Times and The Las Cruces Sun News, Silver City Sun-News, Deming Headlight, Alamogordo Daily News and Ruidoso News, and will be freely distributed at the State Roundhouse during the session. We’ll acknowledge your sponsorship in NMID articles sent to our email list and posted on NMID’s Facebook page, as your sponsorship commitment is received. Go a step further with tailored sponsorship packages that include messages within NMID boosted Facebook posts and prominent placement on our website. $5000: Full page, and sponsorship of all NMID Facebook boosted news articles (average one per week) during session. $3000: Full page, back cover. A special page within the special edition that acknowledges your support. $4000: Prominent sponsorship recognition in the right sidebar of all NMID news articles (boosted and non-boosted) during the session. $500: Placement for four weeks within the text or at the foot of articles, as these spots are available. Sponsor online: CLICK HERE. Click on OTHER AMOUNT to enter your sponsorship amount. To Sponsor NMID online, CLICK HERE. Please give us your name. We can’t accept anonymous contributions. DEADLINE: All sponsorship payments and sponsorship artwork must be delivered no later than December 15, 2018. NMID is happy to assist you with the artwork for your sponsorship.